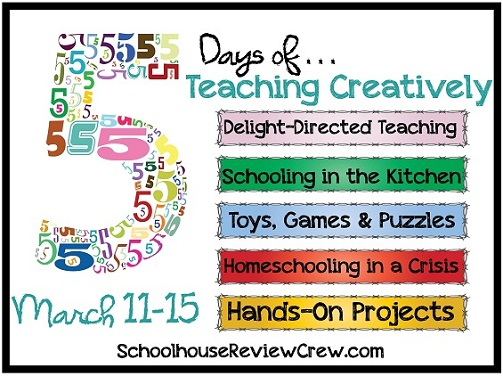 Welcome back to our Teaching Creatively Blog Hop. This week, 80+ members of the Schoolhouse Review Crew are sharing their tips, ideas, and inspiration for bringing more creativity to homeschooling. Today, the focus is on Schooling in the Kitchen. You may be imagining a family doing copywork and math worksheets sitting at the kitchen table right now, but that’s not exactly what we’re talking about. Although, I’m certain that is a common scene in many homeschools. But remember, we’re discussing teaching creatively this week. So, with that in mind, imagine messy science experiments, chemistry in cooking and using baking to reinforce math concepts! You’ll read about these inspiring ideas and more in today’s collection of blog articles! Now, it’s time to . . .